Director Andrew J.D. 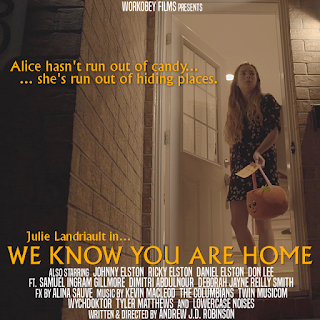 Robinson adapts his earlier short TRICK ‘R TREAT for this beguiling Halloween night chiller, with a fine performance by Julie Landriault as a young woman who gets a housesitting gig that comes with a set of very specific rules: keep to the main floor of the house and don’t bring along a friend. The town exists in the shadow of a missing children case that resulted in Halloween curfews, and Landriault suffers a protracted ordeal initiated by a visit from three trick or treaters clad in old fashioned ghost sheets, clutching the “Missing” posters. A short finely tuned for All Hallows’ Eve viewing, this sustains an impressive level of intensity, with unnerving use of the persistent visitors and the integration of public domain favourite NIGHT OF THE LIVING DEAD playing on TV. A disarmingly melancholic streak, hinted at by the opening text, takes the denouement in an unexpected direction. It is probably the first (but arguably not the last) horror film in which a cardboard cut out of Donald Trump is used for the purpose of a fake scare.